Odeen, an attorney and city councilwoman from River Falls, is running against Republican Sheila Harsdorf, who survived a 2011 recall and has served since 2000. Odeen’s claims make strong accusations against her opponent that, if true, have the potential to influence how voters make decisions about who to support on Election Day. Are these claims accurate? The Observatory investigated Odeen’s claims. State budgets show that education funding actually increased from 2010-2014. The 2010-2011 budget allocated $11.66 million to education. The 2011-2012 budget allocated $11.71 million. The 2012-2013 budget allocated $11.96 million. The 2013-2014 budget allocated $12.39 million. The 2014-2015 budget allocated $12.62 million. The numbers from the 2015-2017 enacted budget have not yet been published on the Department of Administration budget office’s website, but budget numbers from these available years suggest an upward trend, not cuts, in money for education in Wisconsin. According to the Odeen campaign, the $200 million number to which Odeen refers comes from a Legislative Fiscal Bureau memo to Sen. Janet Bewley, D-Ashland, on August 12, 2016. The memo lists net general aid to state school districts in 2010-2011 and 2015-2016, and shows it has decreased by $197 million total. A fact-checking piece from Wisconsin investigative journalism website Watchdog quoted education research director for the Wisconsin Institute for Law & Liberty Will Flanders saying that this statistic is only a small portion of overall education funding. Due to property taxes, decreased enrollment and other revenue sources, overall aid per pupil remains about the same, Flanders said. The Watchdog article said that Democrats purposefully phrased the question to make it look like the Republican majority neglected public school funding. While the number Odeen cites is technically true, it only shows a small portion of the full picture. Just five days later the Democrats received their memo, Sen. Leah Vukmir, R-Brookfield, released an opposing memo from the Legislative Fiscal Bureau. This memo incuded state aid, federal aid, property taxes and other local revenues to show the full picture of education funding. If you disclude federal aid cuts that the state budget does not control, total school district revenue has increased by $20 million since 2010-2011. Odeen’s $200 million number stands correct when taking decreased federal aid into account, but her implication that Harsdorf’s and the state Senate’s legislation caused these actions is misleading. The Observatory rates Odeen’s claim about education funding cuts as mostly false. Is Odeen’s claim correct? It depends on how you’re counting. While the number she cites is technically true according to the Democrats’ LFB memo, the way she counts public school funding is misleading–the memo does not show the full picture of public school funding in Wisconsin. 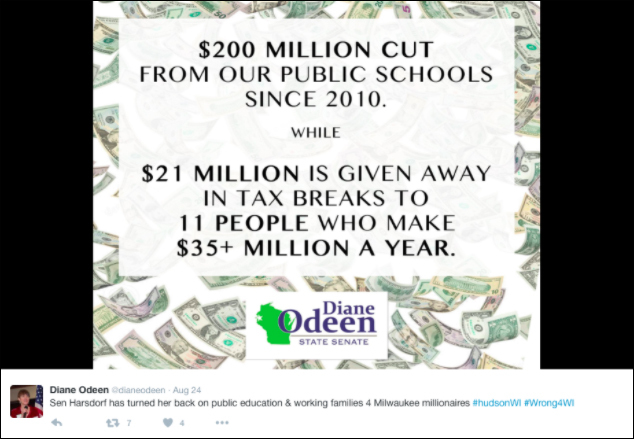 The second claim in the graphic is that “$21 million is given away in tax breaks to 11 people who make $35+ million a year.” The tax break numbers to which Odeen refers in the tweet come from a memo from the Legislative Fiscal Bureau that breaks down the income brackets of people who claimed a Manufacturing and Agriculture Credit (MAC) on their individual income tax. Lawmakers enacted the MAC credit in the 2011 budget, which is a tax incentive for manufacturers and agricultural producers. The memo does in fact show that 11 people who make over $35 million received $21.52 million in tax refief from the credit for tax year 2017. However, those who read Odeen’s tweet could conclude that the 11 people in question are the only ones who benefitted from the tax breaks. In addition to the 11 people earning over $35 million, over 10,000 other Wisconsinites also received the tax credits. In fact, the individuals who received the highest percentage of MACs and got the most money back in credits were those who make $500,000-$1 million. Over 4,500 people who make less than $100,000 also received the tax breaks. Because she accurately quotes a statistic from the MAC memo, but pulls it out of context, the Observatory rates Odeen’s claim about the MAC tax breaks as mostly true. Odeen’s third claim that “Sen Harsdorf has turned her back on public education & working families 4 Milwaukee millionaires” is subjective and cannot be verified. Odeen provided no direct evidence to support this sentence, nor can we assume the two items Odeen pointed to in her tweet are representative of Harsdorf’s record as a senator. Thus, the Observatory rates this claim as unobservable. 2009 Wisconsin Act 28 (2009-2011 Budget). Retreived from Department of Administration Budget Office at http://docs.legis.wisconsin.gov/2009/related/acts/28.pdf. 2011 Wisconsin Act 32 (2011-2013 Budget). Retrieved from Department of Administration Budget Office at http://docs.legis.wisconsin.gov/2011/related/acts/32.pdf. 2013 Wisconsin Act 20 (2013-2015 Budget). Retrieved from Department of Administration Budget Office at https://docs.legis.wisconsin.gov/2013/related/acts/20.pdf. Legislative Fiscal Bureau. Memo re: Estimated Tax Year 2017 Individual Income Tax Distributional Table for Manufacture and Agriculture Tax Credit Claimants. 28 June 2016. Retrieved from Wisconsin Budget Project at http://www.wisconsinbudgetproject.org/wp-content/uploads/2016/06/2017-MAC-Distributional-Table.pdf on 5 Oct. 2016. Legislative Fiscal Bureau. Memo re: General School Aid Changes, 2010-11 to 2015-16. 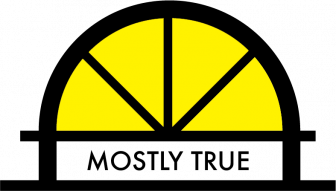 12 Aug. 2016. Retrieved from http://legis.wisconsin.gov/senate/democrats/media/1116/lfb-memo-re-general-school-aid-changes-81116.pdf on 5 Oct. 2016. Legislative Fiscal Bureau. Memo re: School District Revenue by Fund Source. 17 Aug. 2016. Retrieved from http://legis.wisconsin.gov/senate/05/vukmir/media/1083/fiscal-bureau-memo-august-17-2016.pdf on 5 Oct. 2016. Sheila Harsdorf’s Voting Record on Issue: Budgets. Retrieved from VoteSmart.org at https://votesmart.org/candidate/key-votes/3498/sheila-harsdorf/90/government-budget-and-spending#.V-0uXWUle8V. Wigderson, James. “Democrats tout misleading school funding memo as campaign issue.” 17 Aug. 2016. Watchdog. Retrieved from http://watchdog.org/273712/misleading-funding-memo/ on 5 Oct. 2016. Wigderson, James. “State education spending up, according to latest fiscal bureau figures.” 29 Aug. 2016. Watchdog. Retrieved from http://watchdog.org/274583/education-spending-up-latest-lfb-figures/ on 3 Oct. 2016.